Show the front and back cover of Crocodile Beat to the class. Read the title. We know what a crocodile is but what does ‘beat’ mean? Have the students turn and talk to a partner and share some ideas about what the title might mean. Remind students they can draw on the illustration and prior knowledge about crocodiles. Do a whole class share and begin a word wall for Crocodile Beat by recording some of the suggestions. Before reading the book play the video and listen and join in with the song, Never Smile At a Crocodile. Many children will know the tune from Disney’s Peter Pan. Discuss how the crocodile in the song/movie is depicted. Prior to reading the book to the class, prepare yourself by practising reading Crocodile Beat aloud to get the rhythm and the beat right. Now you have prepared, read the text right through with enthusiasm and ask again what ‘beat’ might mean. Compare responses to the original predictions. Are there any similarities to the crocodile in the video? Why do you think crocodiles are portrayed this way? Have you read any books where the crocodile is a different kind of character? Prepare for the following discussion by gathering together some of the other books written by Gail Jorgensen (see More Resources for examples). Read the back cover of Crocodile Beat which gives some information about the author and illustrator. Tell the students Gail Jorgenson was a primary teacher and this book was written in her classroom with her students. Have a look through the other titles and encourage the students to talk about the author’s style. Now read the blurb on the inside front cover. Here the book is described as a ‘delightfully noisy book’. Record this phrase on the Crocodile Beat word wall. Have a quick discussion about what the children understand the phrase to mean.There will be an opportunity to return to this later in the unit. Most students will have seen the animals in this text before. In small groups ask the students to discuss the animals and where they have seen them. Perhaps in another book, at the zoo, in family travel photos, in the back yard (snake), etc. Move around and listen in to the conversations, prompting and reminding the students as to where they might have seen these animals. Have students make lists of where they have seen the animals. Which animals have been seen the most by children in the class? Where were they seen? What was the most common location? Have students work individually to write one or two sentences about any animal from the list above and where they saw it. Encourage students to refer to the charts just made and the word wall. The purpose for the writing is to add to the Crocodile Beat word wall. Write the incomplete sentence below on the whiteboard. When I heard/saw the part about_______________, it reminded me of_____________________. When I saw the part about the monkeys swinging and climbing, it reminded me of a trip to the zoo with my grandma. Tell the students that when you read Crocodile Beat this time you want them to close their eyes and notice when something (an event, character, sound) in the book reminds them of another book or something that has happened to them. Let students record their responses using the sentence structure modelled. Conclude by sharing some of the connections made by the students. Re-read the text. Allow students to join in as you re-read and they become familiar with the words and the beat. In groups of four have students take on the role of sculptor (one student), clay (2 students) and photographer (1 student). The sculptor directs the ‘clay’ into freeze frames. The freeze frames hold the pose for viewing. The photographer captures the freeze frame on an iPad. Swap roles. Once everyone has had an opportunity to be the sculptor, provide time for the students to look at the photos taken and discuss. The sculptor can select an action from the text or use the suggestions below. The lion, ‘I’m the king’. The bears clapping and dancing. Watch out mean croc’s about (clay to represent the lion, bear or monkey). How did you know how to be a lion for example? Prompt to help students articulate the knowledge they have of these animals from other books, TV, films, zoo visits, etc. as well as this text. The characters in this book are all animals. Create word cards for each animal and hand them out to small groups of 4–5 students. The purpose of this activity is to have students discuss and write the sound each animal makes. Before starting you might like to introduce the word onomatopoeia. Brainstorm a list of sounds animals make such as ‘cows moo’ to illustrate. Now model the activity using the ducks. You might write that ducks quack. Encourage the students to think of all the variations. Now look through the book to discover what the author used: quack, quackity, splash. After your modelling, ask each group to write the sounds they think each animal makes and then give each group a copy of the book to search for the way the author wrote the sounds. This can be done orally or recorded. Which sounds were the same? Conclude by giving each group an iPad with Book Creator installed. Each group can find a photo or illustration of each of the animals and write a description of the sound it makes. Sketch to Stretch is used to help students visualise when reading and to give a nonverbal response. Note: Depending on your group you might need to model this activity first. Try modelling with The Three Little Pigs. After reading, quickly sketch three pigs; two with empty heads and the third with brains. Explain that you are thinking how smart the third pig was doing the extra work to build a strong house. When you are ready, ask students to sit at their desks with a blank piece of paper. Explain that when you stop reading you want them to quickly ‘sketch’ what is in their head. That is, they are to draw what they are thinking about. If there is time they can add words. The purpose is to show their thinking. Read the book out loud without showing the pictures. Give students 4–5 minutes to do their sketches. Then in pairs invite students to share their sketches and their thinking. From both the sketches and the explanation given, you can get an insight into what each student is comprehending. Prepare for this activity by choosing sections of the text to model to the students where you have a question (or a wonder) about the written or visual text. Prepare some ‘wonders’ for during reading and after reading. Tell the students you are going to read the book again and you want them to be aware of their thinking as you are reading. Read and stop once or twice to model your thinking. For example you might pause at the bear page and say, ‘I am wondering what happened to make the bears so happy they are dancing around’. Or towards the end, ‘I am wondering what the word glint means.’ At the end stop and share another ‘wonder’ such as, ‘I am wondering if there might be another crocodile waiting nearby’. Give the students two or three sticky notes and a pencil. Before you read the book again, tell them they can write down something they are wondering about either during the reading or at the end. Do a pair-share with the sticky notes before sharing some of the ‘wonders’ with the whole class. Students can put their ‘wonders’ on the Crocodile Beat word wall. Ask students what they notice about the language Gail Jorgensen uses. They might comment on the rhyming words and rhythm. Begin by giving some (or all) students some clapping sticks. If clapping sticks are unavailable students can clap their hands but the sticks will give a clear, sharp sound. This book has a simple four-beat rhythm. Have students clap as you read. Next explore the rhyme by identifying the rhyming words used. Record them. Discuss the words making sure the meaning is understood. Return to the text and read the trickier words like prey in context. Let students infer the meaning. Prepare the words on a sheet in no particular order. In pairs have students cut up the words and do a word sort. Do not give any groups words they can’t read. First ask the students to sort the words by finding rhyming pairs. Next ask students to re-sort the rhyming pairs to make one pile of word pairs that sound the same and are spelled the same (king/sing), another pile of word pairs that have the same sound but different spelling (day/prey). Compare and discuss. Some students might be able to add some rhyming pairs of their own. Add words to the Crocodile Beat word wall. Prepare for this activity by drawing a silhouette of five of the animals from the book. Use the crocodile, duck, elephant, snake and monkey. Put the students in 5 groups, allocating one of the animals to each group. Ask each group to add labels describing the animal they have by referring to their own knowledge of these animals, the book, word wall and other resources that are in the room. Provide each group with a copy of the book and encourage the students to study what the animals say and do so they can infer a description of the animal from those words. Remind students to look closely at the illustrations. Share the posters and quickly add any new words that members of other groups suggest. Alternatively this activity can be done on iPads using Popplet. Now refer back to the first session and the words from the inside front cover, ‘delightfully noisy’. Check if the class can add to the original ideas about why the book was described in that way. Display the posters and adjectives on the Crocodile Beat word wall. Model this first by reading Hattie and the Fox by Mem Fox. This book is also illustrated by Patricia Mullins using the same art techniques. The book has a similar theme to Crocodile Beat except in this book it is the fox after a hen for dinner. After reading give your three-word summary and then justify the words you have chosen. Fear because on each page you were afraid the fox would get Hattie, friends because all the animals cared about Hattie and surprise because the cow frightened the fox with one single ‘moo’. Now read Crocodile Beat out loud. Ask each student to write three words to sum up the story. Then ask them to do a pair-share and justify the words they have chosen. Assess by the words chosen and the justification given. The way students justify the words they have chosen will indicate the connections each student is making and the level of comprehension. Re-read the book and ask students to focus on the illustrations. Put the students in small groups of 4–5. 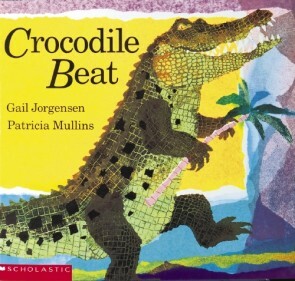 The groups should each have a copy of Crocodile Beat and/or another book by the illustrator Patricia Mullins (see More Resources for examples). Ask the groups to study the illustrations and decide how they may have been created. You may like to have one group look at other picture books to identify other illustrators who use a similar technique (such as Eric Carle). What is the effect of using torn paper? Provide some coloured tissue paper and glue for the groups to collaboratively create an illustration. Ask each group to choose an animal not in Crocodile Beat but one that would fit with the story line, perhaps a zebra or tiger, and create an illustration. If there is time they can add some scenery. Encourage students to look back at the book and the technique used. To practise and perform a simple readers’ theatre you will need groups of nine, consisting of a narrator and 8 students to be the animals. The narrator will read the main text as the animals join in with the noise and actions. Select a student confident to read aloud to be the narrator. Help students to prepare by doing a reading with a focus on the punctuation. Before beginning, discuss the role of punctuation, particularly when reading orally as they will be doing. Demonstrate with the pages below. lion, snake and bears – my word! How many different forms of punctuation are there? What is the function of the comma, the hyphen and exclamation mark? (Prompt as this might be difficult although most students will be very eager to make a suggestion using the context). Have some fun reading this page with and without the punctuation. Finish up by looking back a few pages where the punctuation is a little more complex. “Hey,” said the lion, “I’m the king. Again identify the various forms of punctuation and the function. Help students identify the speech marks and point out how that will help with the readers’ theatre. Read together and demonstrate. The ellipsis (. . .) might be new, however, many students will have noticed this form of punctuation before in books as it is surprisingly common in many texts. Help your students see how it is used to build tension. Again read and demonstrate what this form of punctuation signals the reader to do. Now put students in their groups to prepare the readers’ theatre for Crocodile Beat. While one or two groups organise and practise their readers’ theatre, another group could be practising with their clapping sticks to create sound effects and a musical accompaniment for the performance. Ask students to individually write a description to go with the torn tissue paper art work created. Observe the vocabulary, use of the word wall and other resources, the structure used and the appropriateness of the punctuation attempted. Gail Jorgensen is a children’s author and primary teacher from South Australia. Patricia Mullins is an award-winning illustrator of children’s books, best known for her collage illustrations made from tissue paper. Find out more about her through an interview provided by Scholastic. A reading of Crocodile Beat. Useful for the clear images of the pages with or without the sound. Information on Sketch to Stretch. Sketch to Stretch is an activity designed to allow students to give a nonverbal response to reading. Using tissue paper as a art technique. The tissue paper technique used by Eric Carle. Duration This unit will take 3–4 weeks to complete by engaging in several activities each week. WENDY BEAN was a teacher in NSW public schools and is now an education consultant working nationally and internationally. She regularly works in schools with the aim of supporting positive changes in student outcomes. She lectured in the post graduate program for the University of Wollongong, has worked on many national government projects including National Literacy and Numeracy Week and has designed and implemented a range of professional development courses for systems and schools. She is a member of ALEA and has taken several roles on the ALEA Sydney North local council participating in a range of activities nationally and locally.